Whether it's a small intimate party, large wedding or corporate event, Bybrook Furniture & Event Hire Ltd offer top quality marquees and accessories along with a first class service at competitive rates. 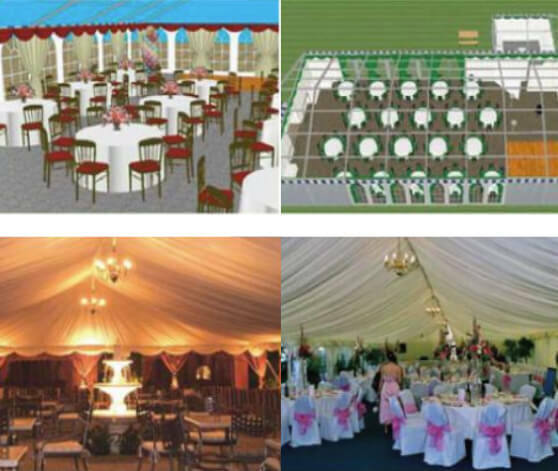 Weddings, parties, corporate entertainment, pub/restaurant extensions, sporting events, exhibitions, charity balls - whatever the occasion Bybrook Furniture & Event Hire Ltd have a solution for you. The multispan range of marquees are modular integrated aluminium systems, offering a modern spacious style without centre poles or guy ropes. The lined interiors give a formal feel allowing more creativity to theme an event. Our multispan walkways are modular and can be extended to any length. They can be used to cover walkways between a building or entrance and the main marquee. With its eye catching peaked roof our oriental canopies present an attractive and original solution in providing cover for smaller areas or as an entrance/reception to a large marquee. Oriental 6 x 6mtr Marquee With its eye catching peaked roof our oriental canopies present an attractive and original solution in providing cover for smaller areas or as an entrance/reception to a large marquee. *Terms & Conditions Apply. Prices based on GRASS ONLY sites (subject to site survey). Prices based on delivery within a 30 mile radius of Leicester central (supplements charged for extra mileage). Wooden solid flooring available at additional cost. The key to a successful event lies in detailed forward planning. Prior to your event we will conduct a detailed site survey to ensure your venue is safe and suitable. We will also provide you with a CAD (Computer Aided Design) floor plan to ensure that your space is neither too small nor over specified. We can offer a full Event Management Service from initial consultation through to planning every detail for your special day, including staff, management, bar service, catering etc. leaving you to enjoy your time with your guests. What's more, you can get everything you need from us including crockery, cutlery, glassware, table linen, catering equipment, refrigerators, ovens, furniture, hog roasts, barbeques plus lots more… and it can all be returned unwashed leaving you with nothing more to do than relax and enjoy your event. You can contact us 7 days a week from 8.00am to 8.00pm and we can deliver and collect your order at times to suit you which means that stress is kept to a minimum. Whether you are looking for a "one off " hire or a regular contract, we can certainly help to make the most of your function by advising on which items may be the most useful and complementary. For an appointment to view at your convenience (evenings, weekends etc.) please telephone 0116 253 0888.